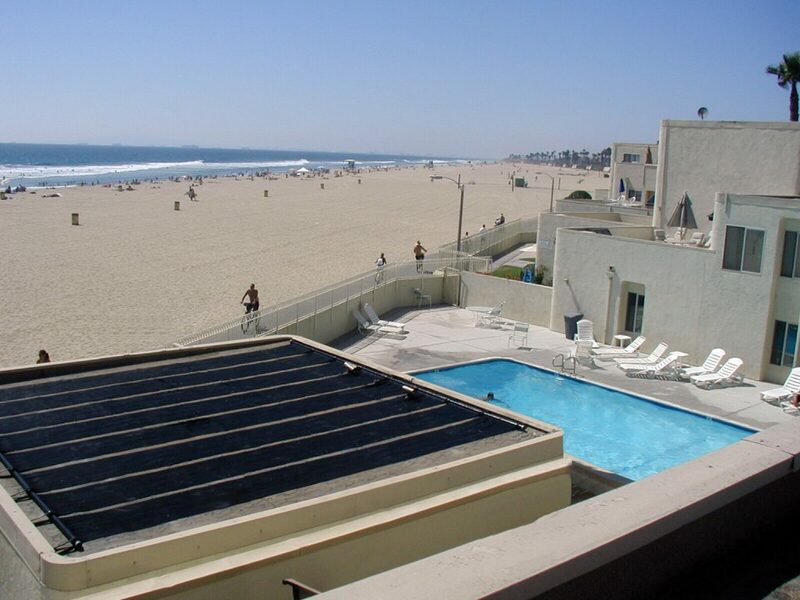 Commercial Solar Pool Heating System custom-designed and installed by Suntrek Industries. When an Home Owner Association (HOA) has a community with a swimming pool, the pool is often one of the most discussed common area Board and Property Management issue in the entire community. Why? First, the pool is an expensive asset requiring maintenance and management with safety being the top priority. Just behind safety, is the cost of heating the community swimming pool. Gas heating is the most commonly used energy source and for year round heated pools and seasonally heated pools, the expense is enormous. Saving money is often the next highest priority behind safety. A solar power system to solar heat the swimming pool is probably the most cost effective energy saving system available. Without any government or utility rebates, solar pool heating systems will often show a 100% Return on Investment (ROI) in less than 5 years. Many times in less than 3 years. When the local utility company provides rebates for commercial solar pool systems, the ROI is often 1 year. Suntrek Solar is California’s Number One commercial solar pool heating company according to the California Solar Initiative website. Property Management Companies can rely on Suntrek to design and install the most reliable, high performance solar pool systems. We will do a feasibility study on each project, provide systems designs and proposals, at no cost to the HOA. 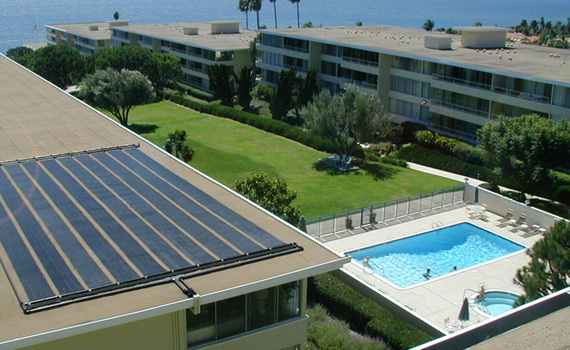 SUNTREK INDUSTRIES, INC, LEADS THE STATE OF CALIFORNIA IN COMMERCIAL SOLAR POOL SYSTEM INSTALLATIONS. In 2015, 2016, and currently in 2017, Suntrek Industries as led the State of California Solar Energy Contractors, going on 3 consecutive years, for number of commercial solar pool energy system’s installed throughout the State of California. Under the California Solar Initiative solar thermal rebate program, administered by the utility companies, Suntrek has led all solar energy contractors in total number of projects completed. “This is a major accomplishment for our company” explains Suntrek VP, Ethan Heine. “We compete with thousands of solar energy companies of who are funded with venture capital or are publicly traded. Suntrek is a family owned company, with over 27,000 customers, and all of our business, without exception, is referred by our customer base”. Suntrek offer’s solar power solutions that include Solar Pool Heating, Solar Hot Water, and Solar Electric Systems for Commercial, Government, and Residential clients. Suntrek has 3 Regional offices including; Irvine in Southern California, Martinez in Northern California, and Las Vegas Nevada. Explore Suntrek at http://www.suntreksolar.com or call today at 800-292-7648. Commercial Solar Pool Heating System custom-designed by Suntrek Industries.